If teeth are not properly cleaned daily the plaque on your teeth will harden and form calculus (tartar). This calculus can not be removed with a tooth brush. An ultrasonic scaler will be used to removed the calculus. If left unchecked the calculus will cause dental periodontal disease (gum disease). There is a genetic and environmental component with periodontal (gum) disease. The risk of developing gum disease can be significantly lowered by taking precautionary measures. Poor Home Care – Lackluster dental hygiene at home is the cause of most periodontal disease. Preventing gum disease and bacterial infections in the mouth starts at home with good oral hygiene. This includes brushing two to three times a day and flossing at least once per day. Furthermore, the use of an electric tooth brush is highly recommended. When bacteria and calculus (tartar) are not removed, the gums and bone around the teeth become infected with bacteria. 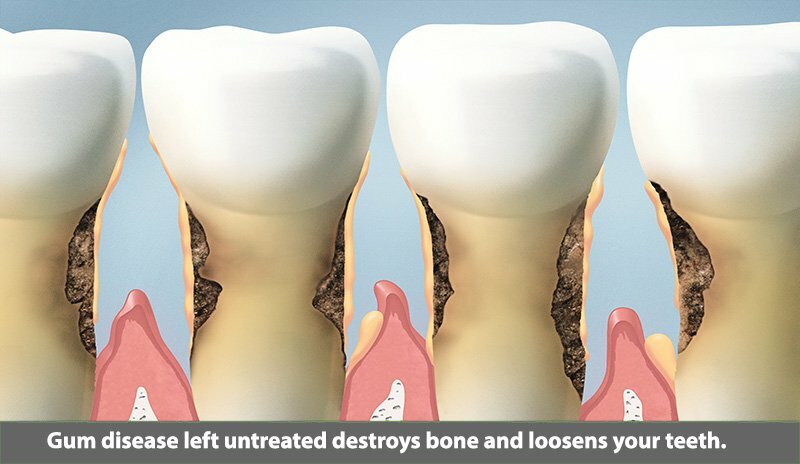 The bacteria toxins and cause gum disease which ultimately leads to tooth loss. Prevention also includes regular dental visits to our Pasadena, Texas Dental Office. These routine visits include exams, cleanings, and x-rays. Excellent home care and routine professional dental care will prevent dental problems. Tobacco use – Studies show that smoking and tobacco use is one of the most substantial factors in the development and progression of periodontal disease. Smokers experience a slower recovery and healing rate. Plus, smokers are far more likely to accumulate calculus (tartar) build up on teeth, have deep pockets in the gingival tissue and present with significant bone loss. Age – Older patients have the highest rates of periodontal disease. Over 70% of Americans 65 years and older have some form of periodontal disease. Pregnancy – During pregnancy, regular brushing and flossing is critical. Hormonal changes experienced by the body causes the gum tissue to become more susceptible to gum disease. Chronic stress combined with poor diet – Stress decreases the ability of the immune system to fight off disease. In conjunction with, poor diet or malnutrition lowers the body’s ability to fight gum infections. Genetic susceptibility – Regardless of practicing rigorous oral hygiene routines, as much as 30% of the population has genetic predisposition to periodontal disease. These individuals are six times more likely to develop periodontal disease. Medication – Many drugs including oral contraceptive pills, heart medicines, anti-depressants and steroids affect the overall condition of teeth and gums. These medications make the teeth susceptible to periodontal disease. Diabetes – Diabetic patients are more likely to develop gum disease. Bacterial infection of the gum tissue can increase blood sugar and diabetic complications. People that suffer from diabetes are more susceptible to infections. Grinding teeth – The clenching or grinding of the teeth can injure the supporting tissue surrounding the teeth.